There are 6 reviews of Jardins d'Armide (new). This is odd but, beautiful. I smell an old-fashioned rose. Powdery, dusty orris, iris, violet, and orange blossom. Wisteria makes its presence known, almost by itself, like a solo vocalist. Then, carnation crawls in. It seems bitter, for a spell, almost like a green stem. Next comes melted, salty butter. Honey, almond, Tonka, and musk become either a Hot Buttered Rum drink or a biscuit / granola bar accord. What a chameleon this is! Iris returns. It stays. For. Awhile. Hey, wait! Now I smell milk chocolate? The original composition was 1909 and this recreation has a beautifully nostalgic Roaring 20s feel about it. The Deco mirrored dressing table with a bowl of dried rose petals, traces of rose talcum powder on the floor, the orange blossom hair tonic decanter left open in a hasty moment, nail varnish tipping from a bottle fallen on its side, the musty honeyed undertone of the old powder compact, they’re all there. As are traces of the good time gal or guy who has just left this room, the scent of their sweet skin musk and oiled hair lingers in this space. Not for everyone I bet, but definitely for me, although I would have liked the nail varnish to have been toned down a tad. The hefty layer of settled powder, however, is right up my street – you’ve gotta say yes to another excess, as the song went. After a few hours the nail lacquer note recedes completely and a lot of the powder has flown, but a superb base reminiscent of many a Guerlain composition emerges from the shadows and takes things to a higher level. The Jardins d'Armide's opening is luxurious, herbal and orangy-rosey hesperidic with hints of powder in a way the first fragrance jumping on mind is the vintage Habit Rouge which was by soon less floral and more "complicately" centered over hesperides, woods, patchouli and soft leather. Anyway I detect a solid hesperidic boise and orangy resinous introduction which appears by soon ambery, vaguely honeyed and woodsy resinous but in a brighter and more floral way in comparison with the great Guerlain's one (finally more glorious, dusty incensey, leathery, resinous, mossy, boozy/spicy). Unfortunately I don't see a great development on skin after the promising beginning and the dull dry down appears powdery/floral with an almost talky iris-violet-carnation almondy accord (pleasant, slightly synthetic but not glorious and multifaceted). Spicy orange (stout till the end), powdery florals plus tonka (glycine and violet in primis plus powdery iris-tobacco) and honeyed (vaguely boozy) amber are the key notes. Anyway a really lovely powdery floral accord with musky accents and a touch of dandy-retro. What a joy this is! I defy any fragrance lover not to react when they smell Jardins D'Armide, even if it is not to one's personal taste. I can't imagine that anyone would find it uninteresting. The opening of this fragrance immediately brings to mind sugared almond dragees, every time! That's a bit odd maybe because I don't think that those particular confections have much of a smell actually, but that is the first image that pops up and floats around. In fact, if you can imagine sweet sugared almonds, and those tiny candied violets which can be found in Madrid, add some orange flower water, some sweetly aromatic dried rose petals, some geranium soap, old fashioned iris powder, and some soft, billowy (and strangely not sweet) nutty vanilla, then you would be with me on this one. It is so gloriously old fashioned! Underscoring this feast of sweetmeats is a sweetly nostalgic floral accord, built around that lovely old fashioned aromatic rose. In time the fragrance settles into an aromatic accord of rose/violet/iris/geranium/almond (heliotrope?) and vanilla/tonka. Jardins D'Armide is certainly sweet and powdery but of course that is it's charm. There is a little brighness too which provides a perfect foil. It is delighful, charming, nostalgic. It strikes me that it was made with unrestrained pleasure and perhaps even a little humour. Base notes: Honey, Almond, Tonka and Musk. I am sure that this fragrance will have it's detractors. It won't be to everyones taste. It is very old fashioned after all, and it will be perceived by some as overtly feminine, too sweet, too powdery. But I also think that it will melt the hearts of many. It presents itself as an homage to fragrances past, with little or no compromise to suit current tastes, and in my view it should be respected for that alone. Dare I say that it would be utterly intriguing on a man. A big hurrah for this delightful fragrance. 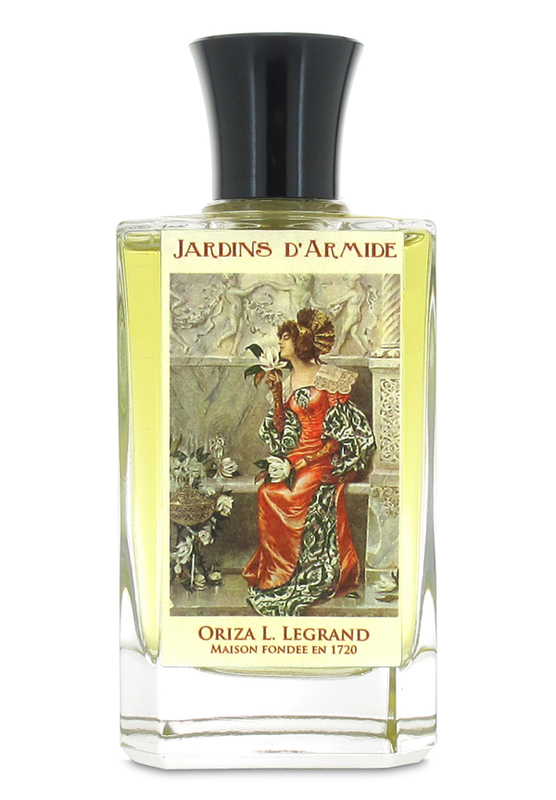 Jardins d'Armide opens with an effervescent orange flower and dull rose floral tandem with an underlying shampoo-like powdery sheen derived from further violet florals, with the overall accord resembling an orange and cheap shampoo spiked root beer float. As the fragrance enters the early heart the violet driven powder takes control and dramatically intensifies as the rose and orange flower remain, now relegated to still significant support. During the late dry-down the fragrance slightly sweetens as the powdery violet driven floral accord recedes, revealing a honeyed amber-like mildly animalic musk base. Projection is excellent, and so is longevity at about 12 hours on skin. This composition was a tough one for me to keep from scrubbing. As soon as I sprayed it on skin I recognized the almost dusty powdered orange and rose florals resembling a Tauer composition I sampled last year called Lys du Desert by Decennial. This may be missing the "Lys" but the real drivers of the two compositions (the powder-laced soapy rose and orange) through the heart phase are quite similar, with Jardins d'Armide taking the powder up more than a notch with its heavy dose of violet. From the open through the heart this one is difficult for any powder hater to tolerate, though things improve in the dry-down as the fragrance sweetens a bit and the powder swaps places with a relatively benign musk and amber-like accord as welcome relief. The bottom line is Jardins d'Armide like all the rest of the surprising Oriza L. Legrande house offerings uses top-notch materials and is relatively well composed, but this 120 euro per 100ml bottle near-scrubber is one only the most ardent powder lovers will be able to tolerate, earning a slightly "below average" rating of 2 to 2.5 stars out of 5 and an avoid recommendation. If you are an ardent powdery Tauer composition fan (something this reviewer definitely is not), ignore the rating and give the composition a shot as it will near-certainly be up your alley. There are no member images of Jardins d'Armide (new) yet. Why not be the first?